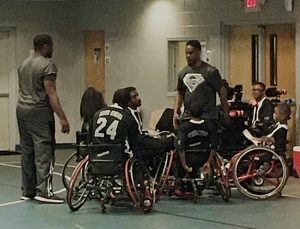 The American Association of Adapted Sports Programs (AAAASP) is holding the Georgia Wheelchair Junior Varsity Handball State Tournament on Saturday (Nov. 4) at the J.P. Mosely Recreation Center in Stockbridge with the DeKalb Silver Streaks as one of the four semifinalists. The Silver Streaks are 4-1 on the season after a 13-5 loss in the regular season finale against the Atlanta Wolfpack and enter the tournament with the best record at 4-1. The Silver Streaks are trying to win their first handball state championship. DeKalb takes on the Houston Jr. Sharks (2-3) at 10:00 am in one semifinal while the Wolfpack (3-2) take on the Henry Hurricanes (2-3) in the other 10:00 am semifinal. The winners meet for the title at 2:00 pm.